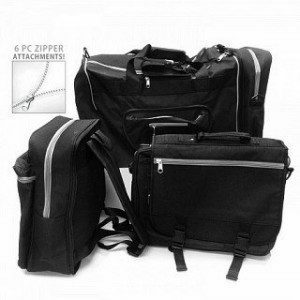 6 Piece Deluxe Travel Bag Set Only $24.99 Shipped! You are here: Home / Great Deals / 6 Piece Deluxe Travel Bag Set Only $24.99 Shipped! We know you are already itching to head out on your summer vacation and this is the perfect deal to grab to help! 6 Piece Deluxe Travel Bag Set Only $24.99 Shipped! Perfect for that quick weekend getaway or a week away from home this summer with the kids! Perfect for the day hike bag! Grab this and other hot deals on all kinds of fun and useful items every day at 13 Deals!